I guess technically this is an event, not sure where else to post this. On March 4th at about midnight CST (so, tonight) I will be Livestreaming South Park: The Stick of Truth here. "South Park: The Stick of Truth is an upcoming turn-based role-playing video game based on the American animated television series South Park being developed by Obsidian Entertainment in collaboration with South Park Digital Studios and published by Ubisoft. The game was expected to be released sometime in 2013, for PlayStation 3 and Xbox 360 consoles, and Windows operating system for PCs, but it has since been postponed to 2014, due to the shutdown of original publisher THQ and numerous delays. Similar to their duties on the TV show, South Park creators Trey Parker and Matt Stone have written the script for the game, are overseeing the project, and are providing the voices of the characters. Details about the game were revealed in early December 2011, in the Game Informermagazine South Park special, and its digital version. 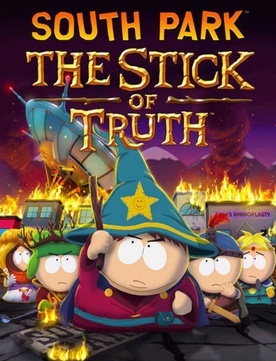 The Stick of Truth follows a number of video games based on the series, including three early titles South Park, South Park: Chef's Luv Shackand South Park Rally released between 1998 and 2000, and more recently South Park Let's Go Tower Defense Play, released in 2009, and South Park: Tenorman's Revenge, released in March 2012."